having time to make poached eggs with toast. lounging with my hubby watching reruns of law & order and the office via netflix. sewing in my studio with the windows open and my favorite voluspa candle making the room smell heavenly. sewing some more. and then sewing something for myself and not for the shop. life slowing down for at least 12 hours. and right now? i'm blogging and chase is playing the piano. counting crows to be exact. i love it. now for some sewing love. here are some earrings for the shop & a clutch i made for myself. 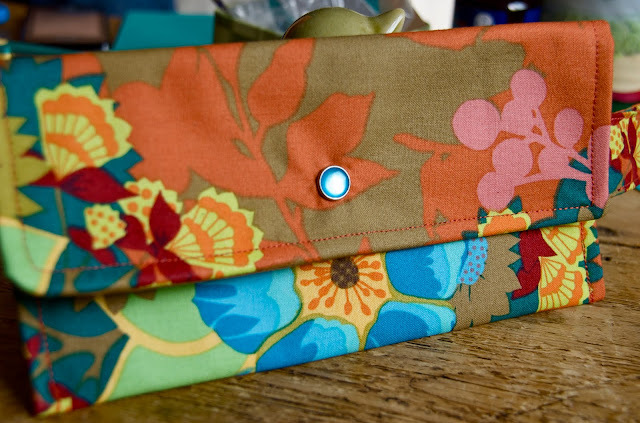 thank you, anna maria horner, for allowing a "ho-hum" clutch pattern i made up from a simple 8.5X11 sheet of paper to turn into something colorful and pretty darn fabulous, if you ask me. i more than likely won't be selling these in the shop. however, i'm 99% sure i am going to be sharing a booth with michelle (she has some GORGEOUS jewelry. check out her blog) at the farmer's market this summer and will start making these up to stock up for that. if you just HAVE to have one, email me or leave a comment and i can make a custom one for you. Kim, My mom passed on our blogsite and I'm now pretty certain I am the only person not sewing and blogging! LOL Your creations are fabulous! We loved the West and traveling b/f kiddos. We read numerous bks and listened to some too while taking roadtrips. Enjoy every memory. You are so talented!! 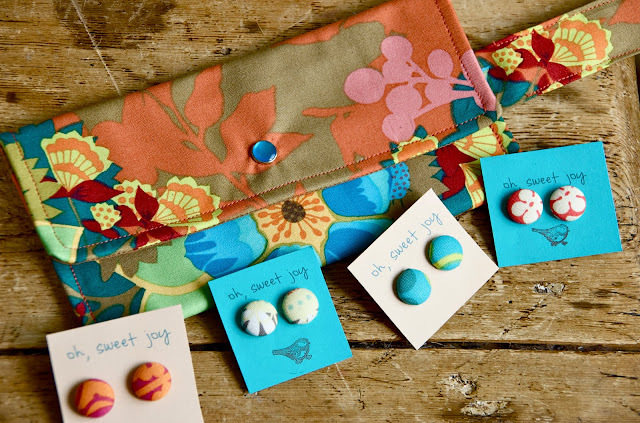 I love the clutch and your earrings are just so colorful and fun!